He was a pioneer trucker in postwar Australia - a time when outback roads were little more than corrugated dirt goat tracks. This is a story of vast distances, ill-equipped machines, heat and dust, humour and mateship. Meet Ray Gilleland, pioneer trucker in postwar Australia. A time when trucks were viewed as an 'upstart industry' that threatened existing railway systems. Ray was part of the new breed, determined not to be chained to the old ways. 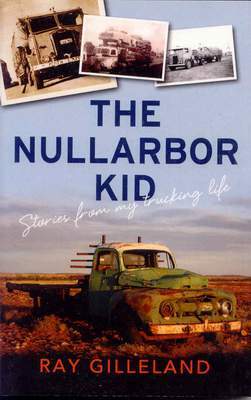 The Nullarbor Kid tells of the true adventures Ray and his mates had when the trucking industry was born, and the battlelines between government and truckers. Ray tells stories of trucks not suited for blistering Australian heat, long mountain climbs in low gear, and the vast distances that sapped the strength of driver and truck. Of tolls, inspectors and regulations set to strangle the new industry, and drivers who fought back with every trick in the book. Of incredible near misses that could have killed them. And through it all, the smell and noise and romance of long-haul driving. In this world, when the chips were down, indeed at all times, humour loomed large and real life adventure abounded. Ray Gilleland's formative years were moulded by the Depression and World War II. As a young man with dogged determination and some luck he pioneered the interstate road transport revolution in Australia, first between Melbourne and Sydney and then Sydney and Perth. The road across the Nullarbor in those days was a sandy track or, in parts when it rained, a yellow muddy canal. Ray was also one of the first to help build and operate a low-loader car carrier. At 70 years of age he hired himself out as a car delivery driver in the United States, having a bit of fun and enjoying new adventures while traversing the entire country, then returning to Australia to concentrate on his writing. Ray passed away in 2012.